The NIST Time Measurement and Analysis Service (TMAS) was designed to serve any organization that is required to maintain an accurate local time standard. The basic TMAS service monitors the customer's local time standard by continuously comparing it to UTC(NIST), the national time standard for the United States, and reports new results via the Internet to the customer every 10 minutes. The optional NIST disciplined clock (NISTDC) add-on to the TMAS will lock the customer’s standard to UTC(NIST), essentially replicating the national time standard at the customer’s facility. The TMAS works by making simultaneous common-view measurements at NIST and at the customer's facility with Global Positioning System (GPS) satellites. Each customer receives an easy-to-install time measurement system that performs the measurements and sends the results to NIST via the Internet for instant processing. Customers can then view their standard's performance with respect to UTC(NIST) using an ordinary web browser, with results updated every 10 minutes. Time is measured with a combined standard uncertainty of about 10 nanoseconds, and frequency is measured with an uncertainty near 1 x 10-14 after 1 day of averaging. NIST certifies these results by sending each customer a monthly report that is in full compliance with the ISO 17025 standard. The TMAS meets the requirements of any facility or organization that needs to maintain a high accuracy time standard. TMAS customers include calibration and metrology laboratories, telecommunication providers, instrumentation manufacturers, military installations, defense contractors, government research laboratories, and financial markets and stock exchanges. Each of these customers must continuously generate time signals and be able to state the uncertainty of those signals with respect to UTC(NIST) so that traceability to the International System (SI) of units can be established. TMAS subscribers receive a calibrated time measurement system that includes everything needed to make state-of-the-art measurements that are continuously traceable to the SI. An easy-to-read instruction manual makes installation a snap. All that is required is to mount a small GPS antenna in a location with a clear view of the sky, to connect your input signals, and to connect the unit to an Internet connection. Once the measurements begin, the customer is linked to UTC(NIST) and the system will require no operator attention. NIST personnel monitor the measurements from Boulder, Colorado, verify and analyze the data, and quickly troubleshoot any problems that may occur. The measurement system blends commercially-available equipment with hardware and software developed at NIST. The software automates the measurement process and presents data in a clear, easy-to-understand format. If any component fails, NIST replaces it immediately using an overnight delivery service. The web-based software allows customers to graph the performance of your time standard over periods of up to 200 days. The results are updated every 10 minutes, so customers always have access to the most recent data. Plus, all data is stored locally and on a NIST server. At any time, customers can retrieve and graph past data recorded by the system, providing them with a permanent history of the performance of their time standard. The TMAS offers a NIST disciplined clock option for customers who need to replicate UTC(NIST) as closely as possible. The NISTDC is based on either a rubidium clock supplied by NIST (Service 76102C) or a cesium clock supplied by the customer (Service 76103C). In either case, the clock is continuously disciplined to UTC(NIST) with a time uncertainty of about 10 nanoseconds and a frequency uncertainty of less than 1 x 10-14 at an averaging time of one day. 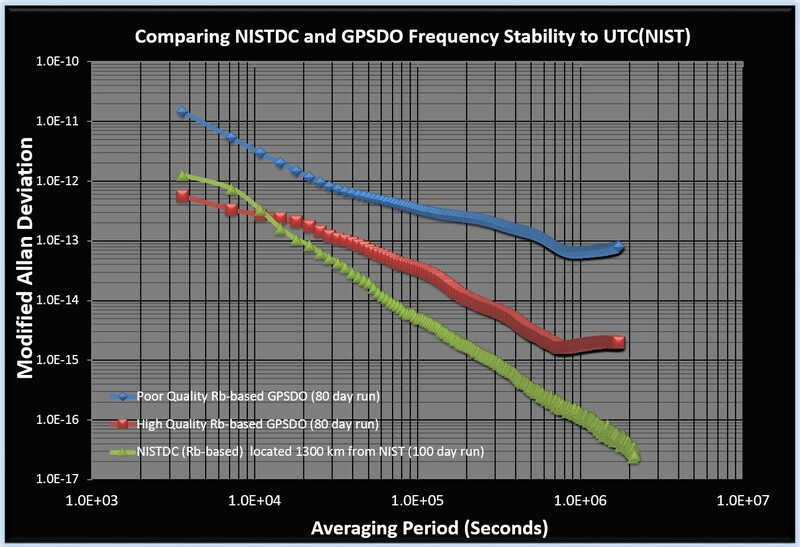 The NISTDC typically outperforms the best GPS disciplined clocks (see graph below) and the time and frequency signals that it produces are referenced directly to UTC(NIST) and not to GPS time, a mandatory requirement for some industries. The rubidium NISTDC provides seven (7) 1 pps outputs and three (3) 10 MHz outputs locked to UTC(NIST). All of the outputs on a cesium NISTDC are locked to UTC(NIST). Either version of the NISTDC can be used to calibrate other devices and can serve as the ultimate in-house time measurement reference, essentially providing customers with a miniature NIST time scale in their facility. Why do we need the TMAS? If your organization has a high-accuracy timing requirement and needs to certify that its time measurements are traceable to both UTC(NIST) and the International System (SI) units, then the TMAS provides you with an ideal solution. Consider that high-accuracy time signals are normally generated by either cesium or GPS disciplined clocks. Cesium clocks are primary laboratory standards that physically realize the SI second. Even so, they cannot recover time by themselves, and need to be synchronized before serving as a time standard. GPS disciplined clocks are continuously adjusted to agree with signals from the GPS satellites. Thus, they are inherently accurate, and nearly always produce time signals that agree closely with UTC. However, because it is not usually possible to measure the time offset of a GPS clock with respect to UTC(NIST), laboratories are often limited to using and trusting the numbers quoted on the manufacturer's specification sheet instead of verifying their results with actual measurements. In short, even if you already have a cesium or GPS disciplined clock, “proving” that your time standard is always within specifications can often be difficult, especially if you must provide documentation to an auditor or regulator. The TMAS can eliminate these problems. Customers no longer need to wonder or worry whether their time reference is within specification, because it is now compared to UTC(NIST), 24 hours a day, 7 days a week. Even better, the results are continuously updated via the Internet so that they can be easily accessed from anywhere. Can the TMAS synchronize and verify our time servers? The answer is yes. If your organization needs to synchronize its time servers with high-accuracy time from NIST, the TMAS has two service options that can help. These options are especially useful for financial market customers, who need to maintain synchronization and establish source to end-point traceability, from UTC(NIST) to the computer clocks that ultimately time stamp transactions. The Time Code Output Option (service ID 76104C) provides customers with a time code that is referenced to the 1 pps signal produced by the NISTDC. The time code is provided in the network time protocol (NTP) and precision time protocol (PTP) format. The Time Code Monitoring Option (service ID 76105C) verifies and compares time codes transmitted by up to 12 external servers owned by the TMAS customer. It does so by comparing the packets transmitted by the servers to the time kept by the NISTDC. The monitored time code will be in NTP format (if the server provides both PTP and NTP, the NTP code will be read and monitored). The measurement uncertainty cannot exceed one half of the round-trip network delay between the TMAS and the time server(s) under test, and is typically less than 100 microseconds. Reporting All results are made available in near real time (maximum 10 minute delay), viewable with any web browser. Monthly calibration reports are mailed by NIST. To request a formal quotation, please call or email the contact listed on the right side of the page. Please feel free to also email or call if you have questions or need additional information. A one-time fee of $1500 is required to initiate service. Includes the procurement, assembly, testing, and calibration of the system, and cost of shipping the system to the customer's site. Provides everything necessary for a customer to continuously compare their time standard to UTC(NIST). The monthly fee covers technical support, equipment replacement, data analysis, and all necessary supplies. 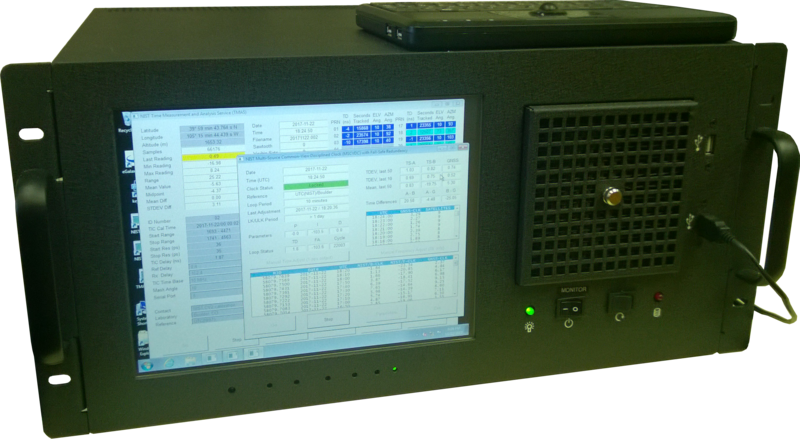 Adds a NIST-supplied rubidium oscillator to the TMAS service. The rubidium is continuously disciplined to UTC(NIST) and has provides seven (7) 1 pps timing outputs and three (3) 10 MHz frequency outputs. In the event of a failure, NIST covers the cost of oscillator replacement or repairs. This service will keep a cesium standard owned by the customer continuously synchronized to within nanoseconds of the NIST time scale. However, please check with NIST to make sure that your model of cesium clock is supported, and please note that the customer is responsible for oscillator replacement or repairs in the event of a failure. Adds a synchronized time server to the TMAS service that outputs a time code in both the network time protocol (NTP) and precision time protocol (PTP) formats. Adds a measurement system to the TMAS that verifies and compares time codes transmitted by up to 12 external servers owned by the TMAS customer. It does so by checking them against the 1 pps signal from the NISTDC. The monitored time code will be in NTP format (if the server provides both PTP and NTP, the NTP code will be read and monitored). Subscribers issue a purchase order for the startup fee and at least 1 year of service. Invoices are sent quarterly and in arrears. For example, after subscribing to the base TMAS service for three months, you'll receive an invoice for $2700 (for the service already received). The service can be canceled at any time. Delivery normally takes place within 4-6 weeks of receipt of an order.